I came across another useful dataset recently that has made my experience using the OS OpenData product I’ve spoken about in my last couple of blogs all the more pleasant. I found it whilst browsing WeoGeo. For those of you have never heard of WeoGeo, it is an on demand source of map data. There is some integration to the service in InfraWorks allowing you to import data found on the WeoGeo market straight into your model, they also have a web portal to browse and download data from. Sometimes the data you’d like comes with a price tag and other times you can find some real gems for free* (*you are required to register with WeoGeo, a small price to pay in my view). The dataset I stumbled across is Ordnance Survey National Grid. It is a single shapefile that contains the geographic grid covering the extent of Great Britain, based on the OSGB36 datum. The grid comprises of six 500 x 500 km squares, of which contain the landmass of Great Britain. A distinct letter was assigned to each of these squares to distinguish them – H, N, S and T. These 500 x 500 km squares were broken further into a 100 x 100 km grid and given a second letter ranging from A-Z based on their location within the larger square. 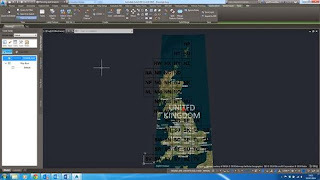 The shapefile can be imported directly into Civil 3D using the Planning and Analysis toolspace. With a simple Add to Map with Query of GRID IS NOT NULL we are only shown grid squares who have two characters assigned. We can then edit the style of the map layer to assign no fill colour and use the GRID database entry as the Feature Label and choose an appropriate size for the text. 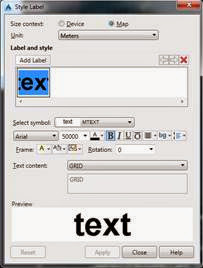 The settings I used for the Feature Label are shown in fig. 1 below. This should now be a lot more presentable than it was on first import. Using the GeoMap command can help you locate a site quickly see fig. 2. The exact grid square can be obtained by combining the two character grid square reference with the 5th number from the Easting followed by the 5th number from the Northing of a coordinate near your site. For example the Grid Square for our Staines office is TQ and the coordinate is 503998,171306. Combining these characters provides TQ07, this reference relates to the file names that come with the OS OpenData products and will allow me to import the right Raster Mapping and DTM products for the site I’m interested in. No more reliance on online grid reference finders for me!